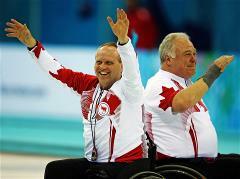 The Wheelchair Curling was introduced into the Paralympic program in Torino in 2006. The sport is the Paralympic equivalent of Curling with the difference lying in the way the players move around the field of play and handle the stone. And most notable — there are no sweeping techniques used. So the sport is not less tough physically and even more complicated technically than Curling itself. The sport is governed by the same organization being in charge of Curling — the World Curling Federation (WCF). The sport is open to male and female athletes who have a physical disability in the lower half of their body, including spinal cord injuries, cerebral palsy, multiple sclerosis and double-leg amputation. Two teams play against each other, pushing stones in turn down the ice towards a series of concentric rings or circles called «the house». The object is to get the stones as close to the center of the rings as possible. Stone: The stone’s weight is 19.96 kg. Handle: A handle is attached to every stone to deliver and release it. Players may use their hands to throw the stone or an extender cue that can be attached to the handle of the stone to push it. The first World Wheelchair Curling Championship was held in January 2002 and in March that year, the International Paralympic Committee granted official medal status to Wheelchair Curling for mixed gender teams. The sport made its Paralympic debut in Torino in 2006 with eight teams participating. The number of teams competing in the Vancouver 2010 Paralympic Winter Games was increased to ten. The first international competitions in Wheelchair Curling were held in 2000 (Crans Montana, Switzerland), and curling was included in the Paralympic Games program in 2006. To perform throws, players in wheelchair curling can use a special device - an extender, which is attached to the handle of the stone and acts as an extension of the player's arm. Sweeping the ice in front the stone is prohibited in the wheelchair curling.